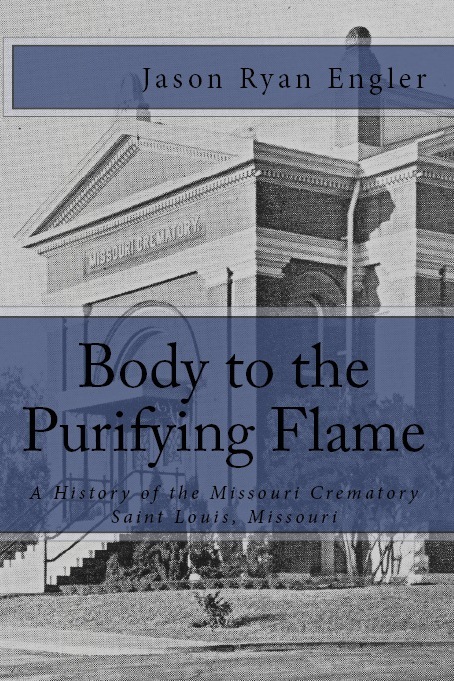 My book "Body to the Purifying Flame: A history of the Missouri Crematory, St. Louis, Missouri" has been released! You can purchase your copy by following this link: https://www.createspace.com/3481880 Enter the code 4JLJ6BEH and you'll receive a 15% discount! 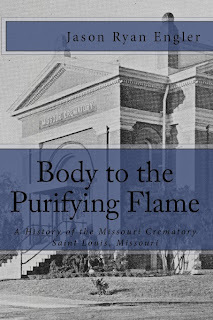 In the late 1870's a group of forward-thinking St. Louisans began gathering to discuss the idea of constructing a building and apparatus to perform Cremations in their city. These friends of Cremation organized into what would become the Missouri Crematory Association, which was incorporated in 1885. The Missouri Crematory was completed in 1888 and was the tenth modern Crematory in the United States. The beautiful Romanesque structure still stands today with its imposing presence. Its rich history, unique architecture and unmistakable place in the history of the city of St. Louis have made this enigmatic structure a monument to those who have been entrusted to its care, and to the Cremation movement in the Midwest. The very first funeral trade journal I ever received was the August 1994 edition of the American Funeral Director. I was fourteen at the time and I was hungry for information about funeral service. Even at that time my primary interest was Cremation, so naturally, I was drawn to advertisements and articles within the magazine about Cremation and Urns. 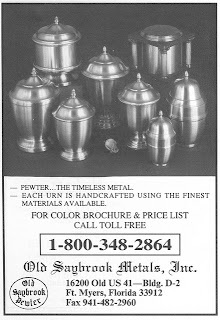 One of the only advertisements that actually had pictures of Urns was one for Old Sabrook Metals. After making a phone call to the company requesting product literature, surprisingly enough, Mr. Garry Lea, the owner and craftsman behind the Old Saybrook line, was more than willing to send me a brochure - even though I was only fourteen years old at the time. A short time later, my parents got a with a funeral director friend of mine and had him order a #301 urn for me for Christmas. It was my very first Urn... A couple years later, I saved enough money to purchase a #601. Just a few years ago, when my dear Grandpa died, he was cremated and we loving placed his cremated remains in an Old Saybrook Urn, and laid him to rest in our family plot. 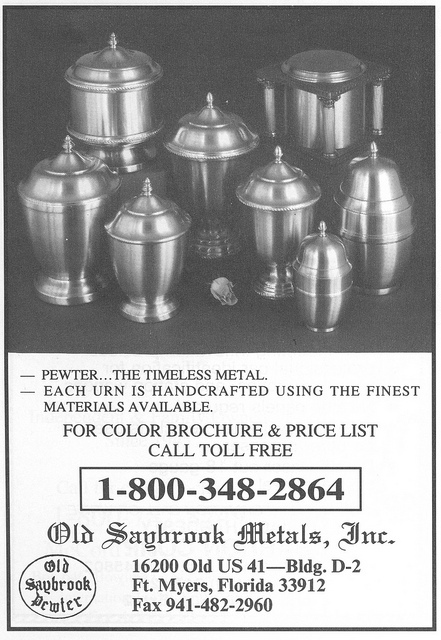 Old Saybrook Metals has been creating Pewter Urns since 1981. Almost everywhere you look, you see their craftsmanship. Wilbert used an Old Saybrook Urn in their line (the Arlington Pewter) for a number of years, and Aurora's Lenox Pewter is also made by them. Both Kelco Supply and Church and Chapel have exclusive designs from Old Saybrook. 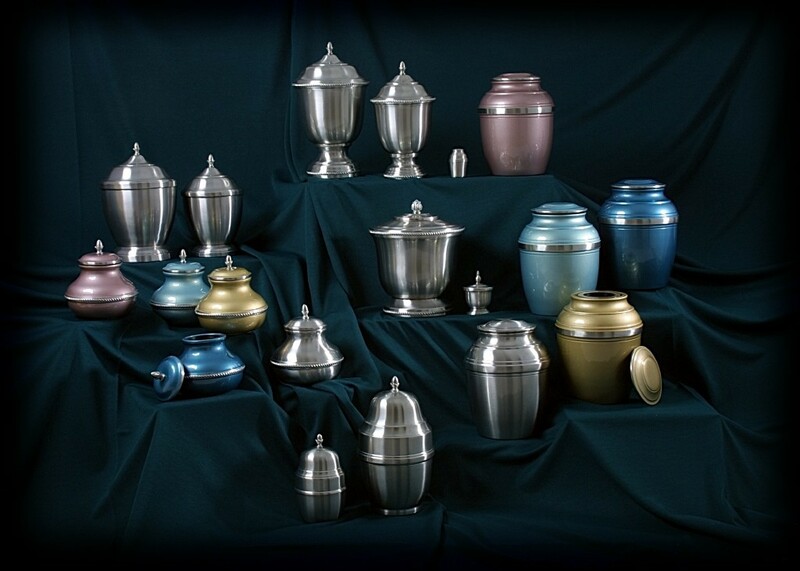 There is no other company in the US that makes genuine Pewter Cremation Urns. Now, I'm not talking about brass urns with a "pewter finish," I'm talking about genuine, real-life Pewter. Pewter is a metal alloy, mainly containing tin, but due to tin's softness, copper and antimony are added for their hardening properties and color enhancement. It has been used historically and in modern applications for tableware, figurines, and many other items. At one time, Pewter items were very popular among aristocrats and those of upper class, mainly due to its beauty and its durability. Each urn is handcrafted on a spinning lathe using the highest grade Pewter available. After the urn is spun and assembled, it is buffed to a high luster satin finish, then coated with an automotive-grade clear coat, not only adding to its beauty, but also providing a degree of protection from tarnishing. 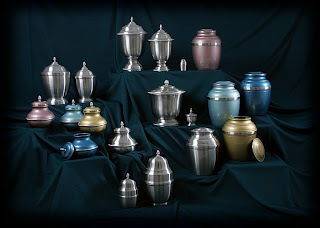 In addition, some of the urns, many available in both keepsake and full-sizes, are finished and painted in different colors (see photo above). In 2010, Garry and Nancy Lea sold Old Saybrook Metals to their long-time friends and largest customer, Kap-Lind Enterprises, originally in Chicago but now located in St. Louis. Lori Simmons, the President of Kap-Lind, proudly carries on the legacy of her predecessors at Old Saybrook Metals. To this day, Old Saybrook's Urns are my most favorite and have a very special place in my heart. After almost twenty years, I am honored to have a continued friendship and relationship with their company. Over time all of these companies have changed – some have merged together, others with larger suppliers and still others with casket companies, some have been sold and relocated – but most are still in the business of supplying handcrafted Urns to the profession. Now, you can find Urns on eBay, Amazon, and more websites and in more catalogs than the mind can fathom. A number of distributors now import a majority of their offerings from India or China, but there are still a number of Urns that are made right here in the U.S.
As you can probably imagine, with a column titled “Urns & Outs” I’ve had dealings with countless Urn suppliers. When I had my company “Engler Cremation Urns” I was proud to supply a wide variety of Urns, and represent a number of these suppliers. A few became my absolute favorites to deal with. Old Saybrook Metals began in 1981 when Garry Lea spun a pet Cremation Urn for the Cremated remains of his beloved German Shepherd. He began creating a similar Urn (#301) for the local humane society before making larger versions and supplying them to the funeral industry. Their #901 is one of the Urns in my column’s banner above, and my grandfather was inurned in their Urn that is exclusively created for Aurora. Most recently, in 2010, Old Saybrook was purchased by their longest and most loyal customer – a company that also got its start in the pet deathcare trade. Kap-Lind Enterprises was originally based in Chicago, but was relocated to St. Louis in 2009. Lori Simmons, Kap-Lind’s principal, is carrying on her family’s business in the heart of the mid-west. In addition to their original bronze and onyx lines, and their newly-acquired Old Saybrook line, they have begun spinning the familiar Old Saybrook shapes in copper. Lori is respectfully and admirably carrying on the legacy of Old Saybrook Metals – and I am personally and professionally grateful for her doing so. MacKenzie Vault Company is based just outside of Boston, Massachusetts. Theirs is a company that has not changed much in their operation over the last 60-plus years they’ve created their Urns. They were the first to create Urns using cultured marble and today their Urns are the standard in the industry in that medium. A company that varies from the two previously discussed, yet deserves mention here, is the Mark Thomas Company. Based in Sleepy Eye, Minnesota, they purvey hand-made ceramic Urns, and hardwood Urns made in the US. But the Urns I prefer from their company are the high-quality, durable brass Urns. They have several that are unique designs exclusive for their company, and upon ordering a couple, I found that they are some of the highest quality brass Urns I’ve ever handled. Their threaded lids find their path and twist on effortlessly – interiors are clean, without metal shavings, and are finished with black paint. I know they’re imported, but of the brass Urns I’ve come across, they’re the best I’ve seen. Additionally, they will plant a tree in an Idaho forest to honor the memory of the person the Urn is purchased for.